The Algiz 7® represents the next generation of mobile PC performance. 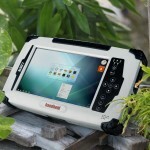 This rugged tablet PC is small, light and fast, with multiple connectivity options and a wide range of functionality. If you work with detailed maps or other visuals and need a larger display than a handheld, or if you need full Windows PC functionality, this Algiz tablet’s 7-inch screen and Windows 7 platform make it a great solution. And it’s tough enough to work in the most challenging environments. Top performance starts with great power. The Algiz 7 features an impressive Intel Atom 1.6 GHz processor, with a massive 64 GB SSD and 2 GB of DDR2 RAM. It runs the state-of-the-art Windows 7 Ultimate operating system, the most powerful tool available for the field user. That means you’ll be able to work in all the top PC applications, in the office and out in the field. And it takes this level of performance to match up with all the mobile capabilities the Algiz 7 delivers. For example, GPS navigation functionality is fully built in. And when it comes to communicating with other devices the Algiz 7 gives you a wide range of options – use Bluetooth for short-range wireless connection to other equipment, or 802.11 WLAN if you have a local network you’d like to sync with. The fully integrated 3G antenna and modem provide high-speed GSM/UMTS/EVDO data transmission. Anytime-anywhere Internet access is the key to productivity in today’s mobile workforce, and the Algiz 7 is ready for Gobi™ 2000 technology – which means that you’ll be able to work on your choice of wireless frequency anywhere in the world. To collect visual information in the field, the Algiz 7 features a built-in 2-megapixel camera with LED light. And you can extend your work capacity with an array of connectivity opportunities, including waterproof USB 2.0 and RS232 ports, plus LAN ports. The Algiz 7 packs all this performance into a small package. Weighing in at a mere 2.42 lbs, this compact tablet features a 7-inch widescreen touch display with the new and unique MaxView™ technology, which provides spectacular brightness in outdoor conditions so you can see your work even in direct sunlight. And you can put in a full day’s work, with a hot-swappable 2600 mAh dual battery pack that lets you change batteries without shutting down. With 10 easy-to-use function buttons and an on-screen QWERTY soft keyboard, you can use the Algiz 7 efficiently in the office. But its heart is outdoors, where its versatility and built-in ruggedness make it stand out. It meets stringent MIL-STD-810G military standards for withstanding humidity, vibration, drops and extreme temperatures, and it keeps dust and water out as well. So use it in any kind of weather, let it rattle on the dashboard, rinse it off after a dirty day – the Algiz 7 is built for hard work. The winning combination of ruggedness and portability makes the Algiz 7 perfect for industries such as homeland security, public safety, field service, GIS/mapping, logistics, railways, telecommunications, energy, law enforcement, military, warehousing – just about anything. If you want portable, professional performance out in the field, the Algiz 7 delivers what you need.